Jimmy Anderson is the most successful England bowler ever because he is the fittest and the most precise. He has bowled more balls for England than anyone (more than 22,000) yet has only missed two tests through injury in more than five years. And throughout that time he has conducted a forensic examination of the batsmens’ techniques. All the great players he has come up against – Sachin Tendulkar and Michael Clarke (9 times), Jacques Kallis and Kumar Sangakkara (7 times), Rahul Dravid (5) and Ricky Ponting (4) – have frequently succumbed. Anderson is a surgeon with a killer instinct. The batsman is the patient on the operating table. Using his various instruments, Anderson systematically dissects the body, probing deeply into the fibre, slowly cutting off the arteries until administering the fatal incision. England’s coaches and analysts sit down and plan the operation for each individual batsman and situation. It is a meticulous scientific process. Anderson is their precision tool. His primary assets are his lithe, athletic frame and his long, slender fingers. With these he projects the ball through the air, coaxing it one way or the other with no discernible change of action. His stock delivery has always been the outswinger to the right hander, the seam tilted fractionally towards the slips, the ball persuaded to swing late with a rhythmic action and subtle pressure from the middle finger, targeting the batsman’s outside edge. Traditionally this was the ball that also troubled left handers, (though it is an inswinger to them.) But increasingly Anderson favours the opposite approach, curving the ball consistently away from the lefties, this time using his index finger to make it swing. In Dubai this tactic brought him quick results with the wicket of Pakistan’s Shan Masood (for the fourth time in 17 deliveries in the series.) It was a classic Anderson dismissal, the ball starting on leg stump and swinging late across the batsman’s hopeful prod, taking the edge. Almost 60 percent of his test victims have been caught by the wicketkeeper or in the slips. 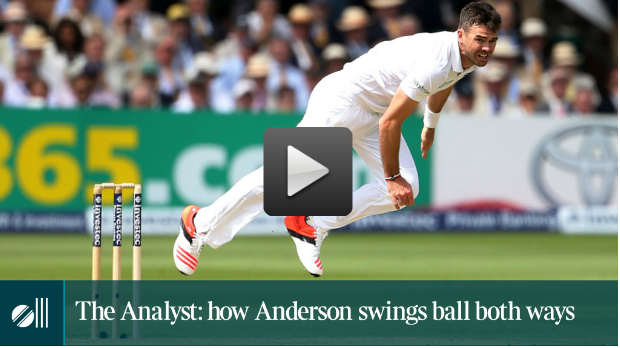 Anderson is in his element in English conditions – he particularly likes Trent Bridge of course – where grassy outfields help the ball maintain its shine. In drier, less swingy environemnts, he makes more use of angles. He bowls from different positions on the crease, and with slightly different grips, toying with the batsman’s judgment, trying to induce uncertainty. He will often go round the wicket for a few balls, then back over. He never lets the batsman settle. Infact he is three bowlers in one. Superlative new ball operator, swinging it both ways at decent pace. If there are left handers at the crease, he goes round the wicket to angle the ball in and curve it away like a conventional left arm fast bowler. Later when the ball is older he will transform himself into an old-fashioned seamer, nagging away on a metronomic length, employing various different grips, including wobble seam – releasing the ball with a wider grip, so that the seam oscillates and it can move either way on pitching. Fast bowling is a tough job. It is painful. Most days some part of the body aches. It might be a sore back, a tight groin or tired feet. Every time a fast bowler delivers he puts six times his body weight through his knees and ankles. Wickets are a paceman’s vitamins. They supply sustenance, vitality, well-being. Anderson has managed to keep going all this time, even when the wickets haven’t come. His stamina is remarkable. He has a broader repertoire of deliveries than any other fast bowler playing the game and yet, true to his Lancastrian roots, can land it on a beer mat. He is phenomenally accurate. He rarely bowls a half volley and never a long hop. The last time he was cut for four, Tony Blair was prime minster. His dangerous tools are hidden in a suffocating blanket. He does not perpetrate dramatic deaths but silent executions. And there is no sign of him losing his killer instinct. Next story Is the Bell finally tolling for England’s no3?